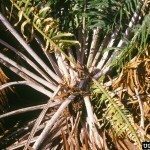 Concern about disease on this expensive palm tree. I have some black spots on the trunk of my Texas Sago Palm. Neem Oil can be used to treat sooty mold.